A whole week since my last post – what the heck happened. The “daycare call”, bonfire parties, Pats parties, holiday, work. Whew. Who knew January could be so eventful. Anyways, this blog is flowing a little like my head these days — all over the place. Hopefully that’s OK with you. Im so happy to have new followers, and I love getting your comments. Tell me more! It gets lonely here in blog world and I’ve never been good at doing all the talking. But today Im craving some product talk, so here you are. 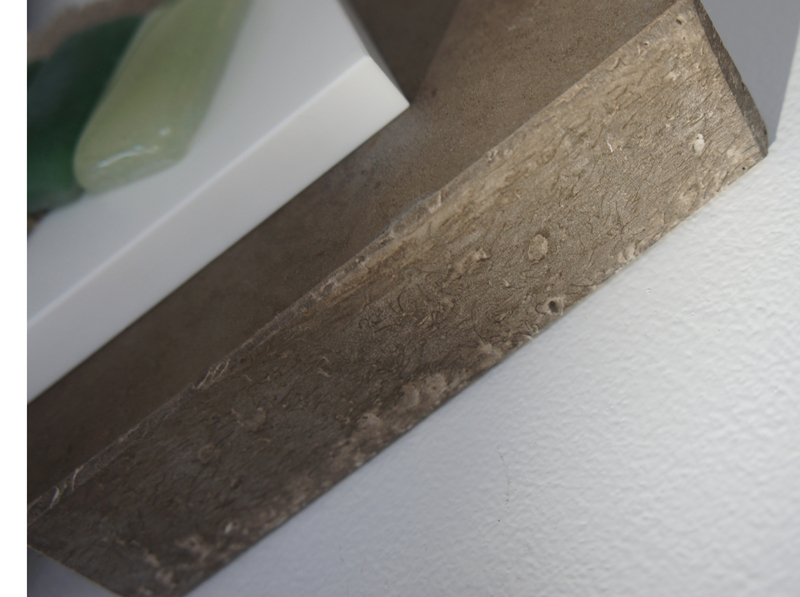 Grad school project turned gorgeous and sustainable countertop material? Meet Ameé Quiricon, a grad student who concocted (by hand, in her garage) a countertop with raw ingredients that can be found in any local community. Even better, she is recycling ingredients that have already been used by consumers and industrial facilities in her local Seattle area. Did I mention she makes these slabs by hand? Originally inspired by Papercrete (recycled paper pulp + cement binder), Squak Mountain Stone is a paper and cement-based composite countertop that has the look and feel of natural soapstone (which you know we LOVE!) and concrete — but with a lesser carbon footprint. Must know more! Ingredients: low carbon cement, waste fly-ash, crushed glass dust, mixed waste paper, and pigments. The post-consumer recycled content is 2.5%, post-industrial recycled content is at least 49%. Cool things to note. Fly-ash is generated at a Washington-state coal-fired electrical generation facility. The mixed waste paper comes from a small home-based document destruction business in WA. The recycled glass is mainly waste from local window manufacturers that is collected and processed by a local glass recycling company. I have three favorite things to note about this product. 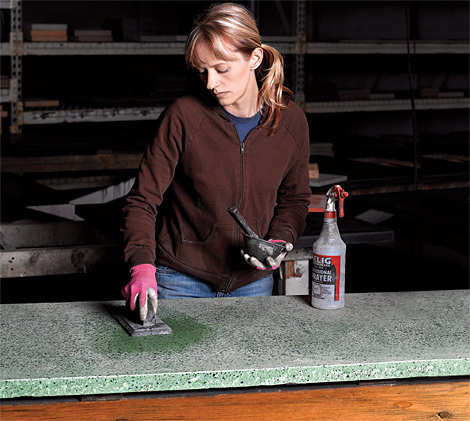 First, it has a “live” edge that boasts an amazing texture (referred to as voids and pits, or more simply “holes”) paired with a super soft top surface. This might sound weird, but it is sort of like a lasagna. On the top its smooth, but when you cut into it you see the layers and textures of the ingredients. Love this! All of the countertops we typically install have a smooth perfected edge, but Squak is not afraid to reveal it’s completely organic imperfections. Second, it exudes warmth. From it’s rustic look, to its tactility, to the 6 color options. It is sure to warm up any space, no matter what the style. 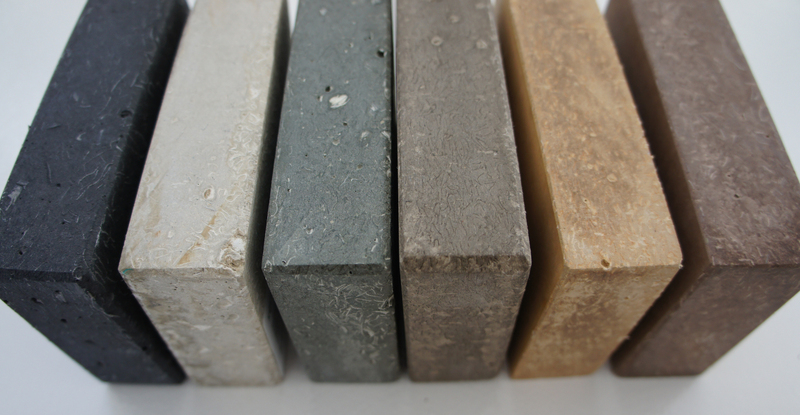 Squak Mountain Stone has 6 warm color options. Third, here goes my childhood nostalgia. It smells like Play-doh!! And if there is one smell from my younger days that brings me back, it is Play-doh. I swear I only played with the stuff because I was obsessed with the smell. I can’t think of any other product samples we have in the studio that I “sniff” on a regular basis. TMI? I know, I know…this product is not for everyone’s countertops, style-wise and maintenance-wise. Squak Mountain Stone may stain, show scratches, and chip especially at the live edges. But much like a lot of natural products that are not chemically treated, it will develop a patina and change as it ages. Kind of like all of us, ha. You just have to be OK with that. Embrace it. The stone can be sealed with a non-toxic and highly durable soy-based clear coat, a food grade natural wax, Tung Oil, or other products of your choosing. Low sheen recommended. 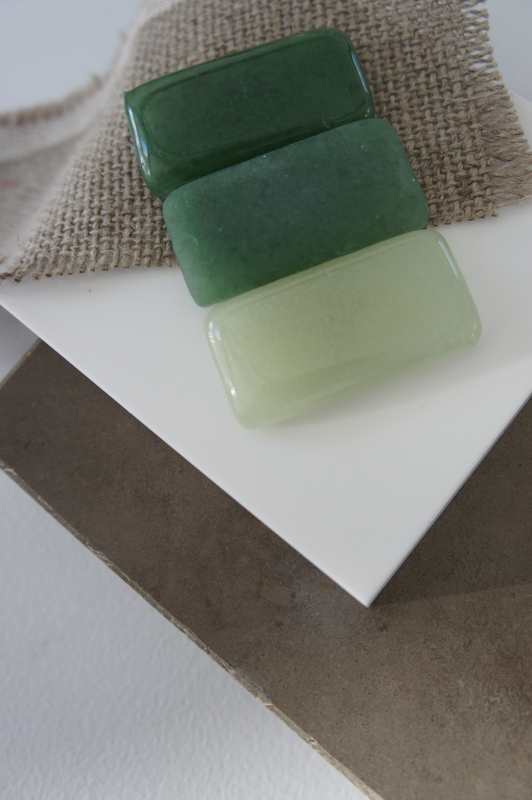 From an aesthetic perspective we love this stone because the finish is matte and the colors are neutral. It brings nature and texture into the space, allowing you to add pops of color in your backsplash, lighting, and other accessories. 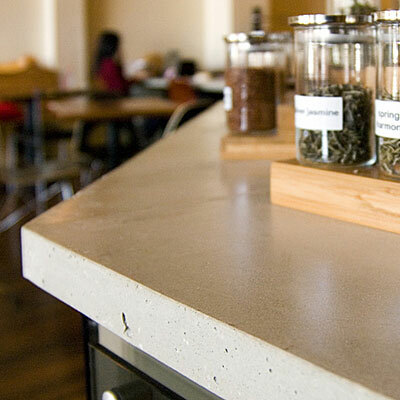 And if it’s not a match made in heaven for your kitchen countertops, what about using it for other surfaces? Think bathroom vanity, tub surround, bench top, table top, desk top, coffee table top, tile, fireplace hearth, and so on. Our color pick here is the Hazel, which looks amazing against a stark white sink. Mix in some greens and natural fibers and you have yourself a kitchen that exudes good health. Makes me want to go plant an herb garden.